Life is progress, life is doing, and life is simply putting one foot in front of the other to discover the greatness of who you are. When you move through the day focused on just this moment in time you will find great joy! If, however, you get stuck in the past ruminating over something that did not go your way it will be like being on a merry-go-round. You may be moving but it is not progressing! You are simply going round and round and where it stops no one knows. Or maybe you find yourself looking down a train track thinking of the thoughts of the past and living those thoughts and fears over and over again? Have you been stuck at a station where only the # 5 comes all day every day! Or maybe you are looking in the other direction in expectation of the future when you can see yourself riding on that train moving quickly to the next station where your good is waiting. Maybe that perfect mate or job or health is there? Seeing what needs to be done to help move your family, community, or country into a better more peace filled and loving place is moving toward progress. That progress only arrives when we live fully and mindfully in the present moment. Are you progressing in life toward opportunities that arrive for good to enter your life? When we forget the “self” (ego) we find the “real” self and are automatically led to do the work of the world. And boy it needs a lot of work! The work of spreading loving kindness is in dire need of help. There is an old saying, “If it is to be, it is up to me.” I hope you’ll progress in life and not stand still doing the work that the world is in desperate need of in this moment and every moment to come. To be happy in life we must have progress in all aspects of our lives…so let me know how it goes! The roots of the tree encompass and transcend differences in the religious traditions from which many of the practices originated, and allow room for the inclusion of new practices that are being created in secular contexts. The branches represent different groups of practices. When used and contemplated they can help us know what is true for us and provide us with simple practices to help us live an ethical life. My goal this week is to choose one area and focus on it knowing that doing this will help me maintain peace, love, and compassion in my life and hopefully make this a better place in which to live. 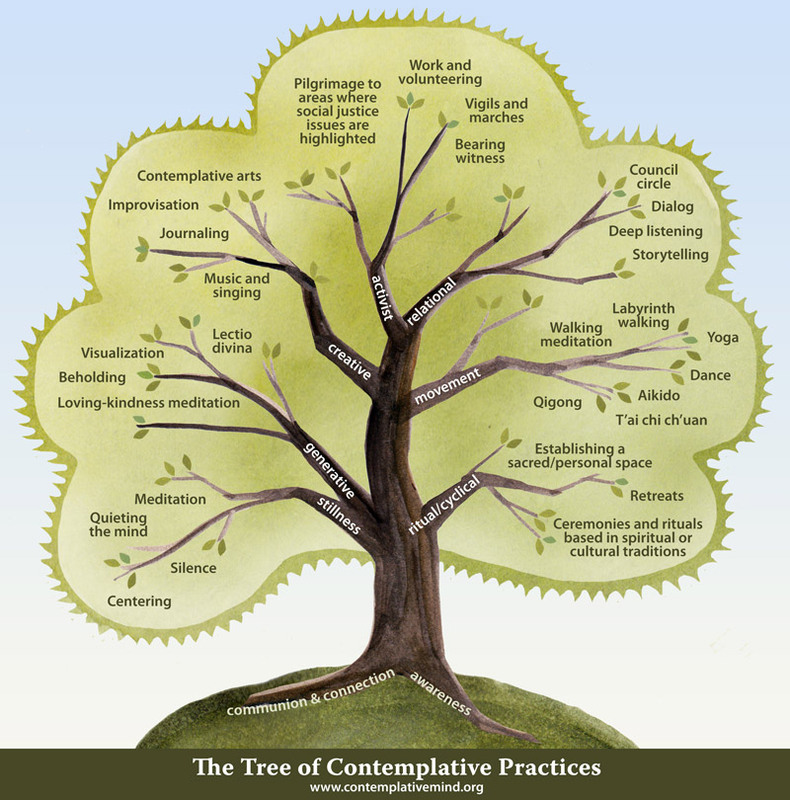 When you go to the link you will find a blank tree there that you can copy and print and put your personal contemplative practices on the tree. This may help you focus on your opportunities to merge your ethical, spiritual, and practical life into one union of knowing the truth and being one with it.